This is a matching number set of 3 of Jack Vettriano's mini Limited Edition Prints consisting of Just The Way It Is, Showgirl and No Turning Back. These mini Limited Editions are signed on the image in red pencil by Jack Vettriano to the bottom left hand corner and are numbered by him to bottom right hand corner. A reverse of Vettriano's standard Limited Edition Prints. 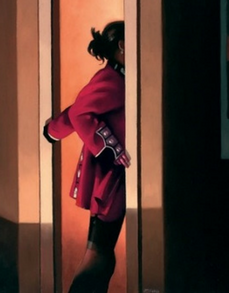 Only 75 of these mini Limited Editions were released by Vettriano, along with 7 Artist's Proofs. The frame selected by Vettriano for the mini editions is a hand finished art deco style frame, with a hand gilded inner beveled edge, which completes the image perfectly. Glazed in museum glass (non-reflective). The framed size is 43 x 41 cms. These stunningly beautiful Limited Editions come with Certificates of Authenticity. Just The Way It Is, Showgirl and No Turning Back are also available individually.